Advances in technology have long played their part in pushing music forward as an art form, from Kraftwerk's devotion to drum machines and synths to Grandmaster Flash's canny knack with a crossfader. And with technology now more accessible than ever, a growing number of Scottish-based musicians and artists are harnessing it in groundbreaking ways. Alternative songwriters such as The Pictish Trail, Jonnie Common, and Conquering Animal Sound all combine devices such as samplers and loop/effect pedals with more traditional instrumentation, creating something new and unexpected. Taking things in an even more experimental direction are the likes of FOUND and Yann Seznec, both of whom showcased their work at Scotland's first ever Music Hack Day in August 2012, organised by the Leith Agency and Scottish Music Industry Association. 'We've almost got to a point with technology that if you can imagine how it would work there is a way of doing it,' says Simon Kirby, Professor of Language Evolution at the University of Edinburgh. Kirby is also one quarter of the band/art collective FOUND, along with Ziggy Campbell, Tommy Perman and Kev Sim (who also creates electronic music under the moniker River of Slime). 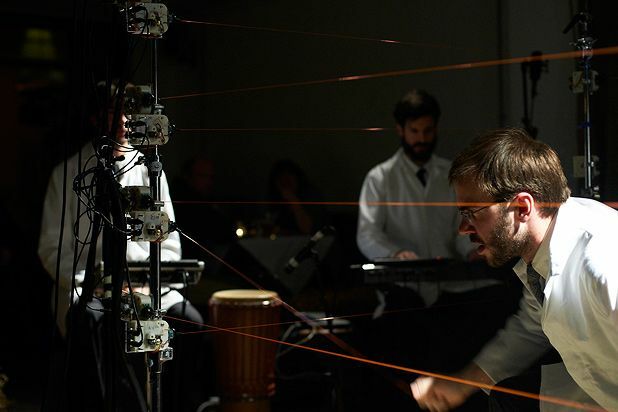 FOUND, who are signed to Glasgow-based label Chemikal Underground, have received international acclaim for their installation-based sound and music projects including the BAFTA winning 'emotional robot band' Cybraphon and their mind-bending collaboration with Aidan Moffat, #UNRAVEL. Their latest project is a smartphone app designed to be a souvenir for the 2014 Glasgow Commonwealth Games. The app's soundtrack constantly changes depending on how close the listener is to the city and in which direction they are facing. Yann Seznec records music under the name of The Amazing Rolo and is founder of Lucky Frame, a small Edinburgh-based company which produces music-based smartphone apps and other quirky creations. He developed a unique instrument for Matthew Herbert's One Pig project, dubbed The Sty Harp, by hacking discarded gametrak controllers ('an obscure, failed motion controller'). As a result he is now a part of Herbert's live band, and has performed in a number of exotic locations round the world.